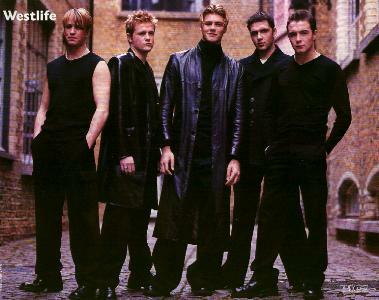 Westlife are made up of 5 talented Irish guys - Shane Filan, Mark Feehily, Nicky Byrne, Kian Egan and Bryan McFadden. Shane, Mark and Kian are from Sligo, Ireland and formed a group called I.O.U. 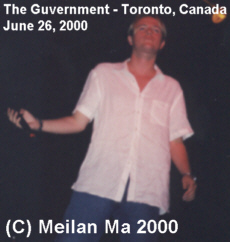 Later they auditioned for more members and that is how Bryan and Nicky became members of the band. Both Bryan and Nicky are from Dublin, Ireland. They formed a band called Westside, but later on had to change their name to WestLife. WestLife were the opening act for Boyzone on their highly successful UK tour and it wouldn't be long before they started to gain a huge, loyal following of their own. WestLife have had tremendous success in the UK with five consecutive number one hit singles, including Swear it Again, If I Let You Go, Flying Without Wings, I Have A Dream/Seasons in the Sun and Fool Again. This is the first time this has been accomplished by any band and it is a record breaker. They have also had success throughout the rest of the world, including Europe and Asia and now the United States and Canada. WestLife are co-managed by Louis Walsh and Boyzone's Ronan Keating. The thing that first attracted me to Westlife was not only their great music, but also with how genuinely nice they seemed. They work really hard and never take anything for granted. 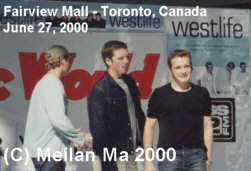 I first became a fan of Westlife's in August 1999. I was on vacation in London, England and the big song at that time was "If I Let You Go". I kept seeing the CD single in all the music stores and I kept hearing the song being played everywhere. Not to mention, I kept seeing the video on TV. I decided to buy the CD single and have a proper listen and I immediately loved the song. I kept playing it over and over again. I had heard about WestLife before from a friend of mine who was a really huge Boyzone fan. But I didn't know too much about them, and I never bothered looking up any information on them. When I got home from my trip, I was really sad. But the one thing that really reminded me of England and the great time I had there was the song If I Let You Go, just because it was being played all the time when I was there. So I kept listening to the CD single I had bought over and over again and it brought back so many good memories, not to mention the song itself is brilliant! To this day, If I Let You Go is one of my fave WestLife songs and that is because of it's association with my trip to London, England. After I kept listening to the CD single and started looking up information about them on the internet and that's when I started liking WestLife a lot. And it's all built up from there. I have become a bigger and bigger fan since then. I've been lucky enough to see WestLife twice. The first time was in New York City at a TV studio in February. We were on holiday and were lucky enough to find out that Westlife were going to be there at the same time. We got to see them perform Swear it Again live, which was incredible, although Mark tried to make his voice sound a bit too whiney. I was just in awe of all of them. They were all incredibly sweet and friendly and lovely. 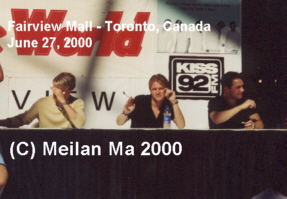 The second time I got to see them was in Toronto, during their promo trip. They did a free gig at the Guvernment, which was lovely. I had to line up for ages, managed to get front row and got really squished and bruised in the process! But it was well worth it, because Westlife were in top form and hearing them perform a few songs live was just incredible. They sounded incredible, they interacted with the audience... it was amazing! I danced and sang along like an idiot! They sang Swear it Again, I Don't Wanna Fight, Flying Without Wings, If I Let You Go, No No, and I Need You. The next day they did an autograph session, which was insane! Loads of girls showed up. 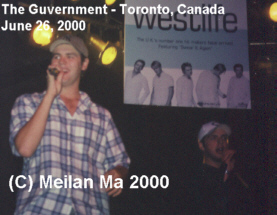 We got there at around 9 am, Westlife weren't scheduled to be there until 5 pm. Luckily they gave out tickets, so we didn't have to stand in line all day. We got to do a bit of shopping and have lunch before we went back. Westlife showed up right on time, and sang 3 songs, Swear it Again, Flying Without Wings and If I Let You Go. I was close to the stage, so I had a pretty good view. I was nervous yet excited at the prospect of meeting WestLife. The whole thing lasted about 1 minute though only. The security guards pushed us on stage and then pushed us off again - literally! So that was a bit annoying! But I got my CD signed and I got some nice pictures as well, so I was happy. And they were all lovely, especially Shane. It was a wonderful day! Bryan, Mark and Shane walking out onto the stage Kian, Nicky (waving hello to a bunch of girls who screamed) and Shane. even put on some sunglasses later on. Click on the links below to hear Westlife's terrific music.